Posted January 28, 2013 at 6:48 pm by robinaireheating.com & filed under hvac, maintenance program, robin aire, routine maintenance . Posted January 21, 2013 at 6:59 pm by robinaireheating.com & filed under robin aire, winter tips . Posted December 10, 2012 at 3:28 pm by robinaireheating.com & filed under Uncategorized . 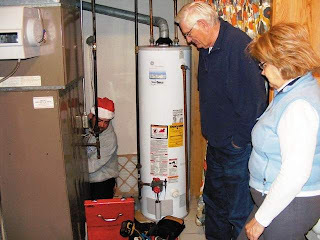 Service Technician Mike Greulich inspects Jerry and Lucy Hayden’s furnace as part of Al Keats Day-Project Heat, the volunteer effort to help out local seniors in need. Jerry and Lucy Hayden, of Farmington Hills, will be getting a new furnace, and a potentially dangerous situation was avoided, thanks to the volunteer efforts of companies participating in Saturday’s Al Keats Day-Project Heat event. For nearly three decades local senior citizens have been helped out by Al Keats Day-Project Heat, which is sponsored by the Southeast Michigan chapter of the Air Conditioning Contractors of America (SEMIACCA). This year, 15 contractor member companies with over 40 volunteer employees met at Day & Night Heating & Cooling in Novi to perform free furnace cleaning, safety inspections, repairs, and furnace replacements for needy senior citizens in metro Detroit. For Robin Aire’s Lead Service Technician Mike Greulich, who was helping out for the first time, volunteering for this was a no-brainer. Last Saturday morning, he made his first volunteer call to the Haydens’ home in Farmington Hills to inspect their furnace. Greulich initially made sure the furnace turned on and then checked the heat exchange as well as inside the furnace for any cracks. He used an extended infrared camera to see into it. This call turned out to be a really important one because the Hayden’s furnace, put in nearly 30 years ago, had some cracks in it, which can potentially be dangerous and can leak exhaust fumes into the home. It also lowers the temperature and causes it to take longer to heat the home. The Haydens were very grateful that this was discovered. Robin Aire planned on going to their home on Tuesday and replacing it with a new one. SEMIACCA works closely with the Wayne and Oakland County’s Area Agency on Aging to coordinate the service calls. To date, the group has completed over 1,700 free furnace tune-ups and repairs, and replaced approximately 70 furnaces – at no charge. SEMIACCA members have installed over 250 free carbon monoxide alarms in the last eight years as well. Craig Jones, also with SEMIACCA and Slasor Heating & Cooling in Livonia, said Project Heat is really important because it helps out people who a lot times have to choose between paying to fix a furnace or for their everyday needs like food . Local companies helping out were Day & Night as well as Robin Aire Heating and Cooling of Wixom. Both see this is as an important service. This was its 26th year and each time it has made a positive impact. To learn more about SEMIACCA, visit www.semiacca.org. Posted October 16, 2012 at 5:57 pm by robinaireheating.com & filed under heating system, robin aire, routine maintenance . Posted July 11, 2012 at 3:00 pm by robinaireheating.com & filed under contractors, robin aire, tips .